DapperLads - *Exclusive* Red Winter Knicker Set - Knickerbockers - US made Victorian fashion boys knickerbockers sets with genteel nostalgic appeal. Close-Out Sale! Just sz 12 mo is left. Note: Bow Ties are being updated with new style. New picture coming soon. DapperLads exclusive for the holidays. Part of the Enchanted Infants Collection. 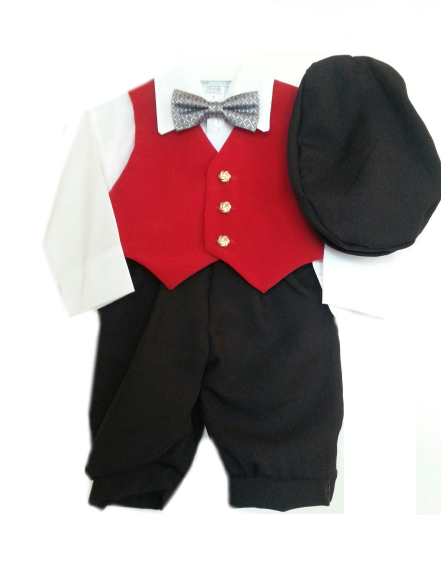 This unique ensemble includes wrinkle-free polyester black knicker pants and cap, red velvet-finish vest, a white cotton-poly dress shirt and a silver patterned wrap around bow tie. US made exclusive of the bow tie.